”WIND POWER AND SOLAR POWER – The most popular and most well-known among the alternative forms of energy are wind power and solar power. Nowadays, you could easily get solar panels or small wind turbines installed on your home, company or local area. With the latest the latest technology, wind mills are silent and efficient. Moreover, recent breakthroughs in solar energy have also made it not only more efficient, bit more affordable as well. In an effort to change its environmental record, China has recently become one of the greatest manufacturers of solar panels, a main reason for its rapid decrease in price. 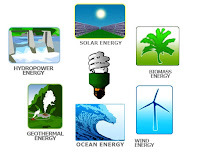 Solar and wind power are the main sources of renewable energy that I would recommend for your home (geothermal energy works well in certain areas too); the other sources of energy are still worth looking into however. It should also be mentioned that large fields of solar panels and wind mills built by corporations can power entire cities. Great progress is being done in this domain. 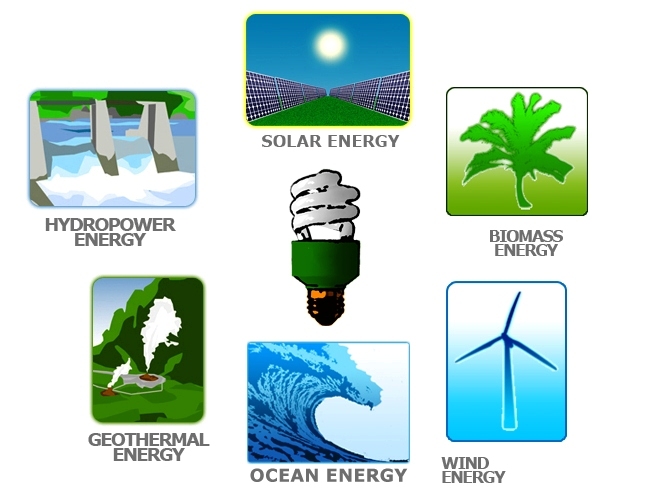 However, as aforementioned, there are numerous other sources of alternative energy that you should be aware of. HYDROELECTRICITY – Hydroelectricity allows a great amount of electricity to be generated without using up any fossil fuels. Unfortunately, although hydroelectricity is renewable, it is actually quite hazardous to the environment. For instance, entire forests are cut down and dangerous chemicals are released through its construction. Furthermore, the construction itself takes up a lot of resources and can’t be reused (as opposed to solar panels and wind mills). Notably, the Three Gorges Dam in China has displaced about 1.3 million people and caused numerous landslides. As a matter of fact, numerous protests have ensued in the hopes of stopping the construction of hydroelectric dams. TIDAL POWER AND WAVE POWER – Tidal power works in similar fashion as hydroelectricity but does not have such negative effect on the environment. Essentially, it is situated in oceans and converts the energy of tides into electricity. In addition, wave power is the transport of energy caused by ocean surface waves. Hence, wave power turbines are also located in the ocean and will not require huge reservoirs that inundate entire forests. GEOTHERMAL ENERGY – Geothermal energy is yet another recent breakthrough in green technology. In essence, it converts thermal (heat) energy from the Earth into power. In fact, geothermal energy is not only used to generate electricity but can also be used for district heating, space heating, spas, industrial processes, desalination and agricultural applications. This revolutionary form of energy is highly popular in Iceland and its technology continues to improve over time. Moreover, geothermal energy can be harnessed in hot springs or in locations with notable volcanic activity. As you may guess, not many places are suitable for this type of energy and it is fairly expensive to develop. Nonetheless, like solar panels, the price and availability of this type of renewable energy will improve in time. NUCLEAR POWER – Nuclear power is technically renewable because, theoretically, the uranium stored should continuously produce power. In France, nuclear power works very well and generates much of its electricity. However, some nuclear power plants have wrongfully disposed of its nuclear waste and this is a very serious environmental problem. In fact, due to its nuclear waste, many environmentalists have not coined nuclear power as renewable energy and are actually demanding the closure of certain power plants along with cancelling future projects. Incidentally, the very real possibility of nuclear meltdown (such as the one in Chernobyl) will cause many to not support nuclear power. HYDROGEN FUEL CELLS – Hydrogen fuel cells offer the possibility of vehicles to release only water vapour and will be 2 to 3 times more energy efficient than gasoline or diesel. Basically, hydrogen is pumped into the tank of a car or bus, like gasoline. Many automakers have already set plans for the commercialization of hydrogen powered cars by 2015. Hydrogen power will not only ensure a healthy environment but will also reduce fossil fuel dependence which can seriously harm a nation’s economy. Although hybrids will reduce greenhouse gases, they will not be as good as hydrogen fuel cells or electric cars. However, it should be noted that the production of fuel cells or batteries (in the case of electric cars) are not completely green although they are still better than their alternatives. Therefore, taking public transit, walking, cycling, and even carpooling will ultimately be more environmentally friendly. The future seems bright with environmental scientists tirelessly finding ways to make alternative forms of energy affordable and sustainable. We could also trust that new and groundbreaking forms of energy will soon be discovered. In the meantime, if we really want to cushion the impact of climate change, fossil fuels must be disregarded for alternative forms of energy.